Pertama tama yang paling memukau gw adalah Kualitas Sounding yang ditawarkan Oleh Band Groove Death/Thrash dengan Female Fronted asal Athens, Attica, Greece adalah sangat Mengagumkan !! Sophisticated and Excellent Quality untuk ukuran Single Gratis yang khabarnya didistribusikan secara Independent saat penampilan Panggung mereka. meskipun memuat 3 lagu didalamnya, tentu kalian akan sangat terkejut dengan Produktifitas band pimpinan Cewek Cantik dengan Nickname sebagai Hel Pyre bareng Gitaris Cyan. poin manis di sini adalah hadirnya Additional Drumer Legendaris Thrasher Jerman Sodom, Markus Freiwald yang memperkuat Band Kawakan Sodom sejak Tahun 2010, Gitaris Waldemar Sorychta ( Ex. Voodoocult, Despair ) yang kini memperkuat Barisan Californian Groove/Post-Thrash Metal Grip Inc. bentukan mantan Drummer Legendaris Slayer, Dave Lombardo, Waldemar tidak hadir mengisi guitar saja tapi juga menjadi produser Single ini bersama Enjiner Kondang Jerman, Dennis Koehne yang sudah banyak sekali band2 Top ditangani-nya, seperti Sodom, Lacuna Coil, Moonspell, Tiamat, Samael, etc .... ditambah Kontribusi Vokal dari Pentolan Trio Trasher Legendaris, Sodom, Tom Angelripper dihadirkan disini. well bener2 credit Musisi yang menaikkan Rating Argumen tentang Rilisan ini. 3 lagu Groove Death/Thrash dengan Kualitas Sound yang Perfect banget menjadi Tanduk awal Afterblood Mengibarkan Eksistensinya sejak terbentuk tahun 2011. terpesona juga gw dengan segala Kreatifitas Band ini yang kendalikan oleh Female Fronted Hel Pyre bareng gitaris Cyan untuk mengantar nama mereka besar nantinya. " Take " membuka hentakan mantap Headbang Riff part yang mantap !!! pukulan Drummer Markus Freiwald memang Dasyat siksaannya membayangi Catchy Riff Cyan yang lebih menyuguhkan Elemen melodius dengan beberapa senggolan solo hitamnya. struktur musik yang memang tertata sebagai Easy Listening Part, memang lebih mudah ditangkap dengan insting kita apalagi didukung dengan kualitas rekaman yang Dasyat seperti ini, Raungan Harsh Vokill Hel Pyre lebih memberikan Aroma Kelam pada setiap Sentuhannya mengingatkan dengan Angela-nya Arch Enemy. Hell, I wouldn't even include Groove Death/Thrash Beating in a discussion I was having about the greatest thrash Composition of all time. The truth is, Afterblood songwriting has always lacked the extra substance necessary for them to be considered among the truly elite. However,This Release has been continuously blasting through my various pieces of audio equipment and I can't help but wonder if maybe it's me who's missing something, Than Great and Awesome Arrangement ! " Mission of Aggression " kemudian lebih menawarkan komposisi Death/Thrash yang lembut sentuhan elemen Melodius-nya disetiap Langkah aransemen dan spesialnya, Tom Angelripper-nya sodom ikut meraungkan Vokal-nya disini bareng Hel Pyre, sebuah Kombinasi musik yang menjadi semakin bernyawa. and the slower moments only build up the listener's anticipation of further mind-ripping segments. The solos are substantive enough to prove that they are still a very necessary element of this type of agressive music, and the melodies are memorable. Another aspect that sets this band apart from some of its decaying competitors is Tom Angelripper's vocals. semakin lebih mengunggulkan elemen Headbang Part pada attitude bermusiknya yang kali ini gaya Solo Melodiusnya mengingatkan dengan sentuhan Amorphis lama serta My Dying Bride walau masih belum bisa mengalahkan komposisi kental ala In Flames baru-nya, serta mungkin beberapa gaya Arch Enemy tetap terdengar jelas. Each solo actually has a very narrative element to it with slow and fast interchanges, heavy scale exploration and a very methodical choice of note sequences in each measure of the rhythm. dan Track terakhir " Beyond " kita bisa dengar sambutan Solo Gitar Waldemar Sorychta yang terkenal dengan Gaya Melodius Briliannya memberikan kesempurnaan sentuhan Track ini. It was really melodic and catchy, but still in your face and kicking you into overdrive waiting to hear the next track in wide-eyed anticipation. It's the kind of record that a band releases mid-career, but as we all know. buat kalian yang sempat ngefans dengan gaya Amorphis, In Flames baru hingga Arch Enemy yang dominan dengan headbang Catchy Part, tentu akan langsung Falling In Love dengan Band ini. Hadir dengan desain Artwork sang Vokalis, Hel Pyre, yang teryata jago urusan Desain Grafis ini memberikan Sentuhan yang Lumayan Horrific terhadap art-nya. Yes, Extended CD Single for Live Audiences is ultimately an average thrash record, but it has a number of strengths that can't be argued. Absolutely sound is vexed, as if he's still ready to set the world on fire at the drop of an incendiary. The production is eminent, one of the best or at least most accessible efforts in their entire career, and the songwriting is also quite diverse, with extended melodic passages that balance out the more direct. YOU MUST TRY IT NOW !!! First of all, the most riveting gw is offered Quality Sounding Band Groove By Death / Thrash with Female Fronted origin of Athens , Attica , Greece is so Awesome ! ! Sophisticated and Excellent Quality for the size of the khabarnya Free Single Independent distributed as their stage performances . although it contains 3 songs in it , of course you will be very surprised by the Productivity band leader Gorgeous Girls with Close as Hel Pyre guitarist with Cyan . sweet point here is the presence of the legendary drummer Additional Sodom Thrasher Germany , Markus Freiwald who strengthens Veteran band Sodom since in 2010 , guitarist Waldemar Sorychta ( Ex. Voodoocult , Despair ) is now strengthening the Barisan Californian Groove / Post - Thrash Metal Grip Inc. . formation Legendary former Slayer drummer Dave Lombardo , Waldemar not present to fill the guitar , but also a producer of this single with Kondang German Engineer , Dennis Koehne who have a lot of band2 Top tackled her , like Sodom , Lacuna Coil , Moonspell , Tiamat , Samael , etc .... plus the contribution Vocals Trasher Trio of Legendary frontman , Sodom , Tom Angelripper presented here . well bener2 Credit Rating Musicians who raise arguments about this release . 3 songs Groove Death / Thrash with the Perfect Sound Quality really be the beginning of Afterblood Flying the Horn of Existence since forming in 2011 . i also fascinated with all the creativity this band is controlled by a Female Fronted Hel Pyre guitarist with Cyan to take their big names later . " Take " opened the steady beat of a steady part Headbang Riff ! ! ! Drummer blow Markus Freiwald was terrible torment, haunt Catchy riffs Cyan presents a more melodic elements with some scratching solo black . musical structure is arranged as Easy Listening Part , are more easily captured by our instincts especially supported by such a terrible recording quality , the roar Harsh Vokill Hel Pyre more giving Aroma Dark at every touch was warned by his Arch Enemy Angela . Hell , I would not even include Groove Death / Thrash Beating in a discussion I was having about the greatest thrash Composition of all time . The truth is , Afterblood songwriting has always lacked the extra substance Necessary for Them to Be Considered among the truly elite . However , This Release has been continuously blasting through my various pieces of audio equipment and I can not help but wonder if maybe it's me who's missing something , Than Great and Awesome Arrangement ! " Mission of Aggression " then more offers composition Death / Thrash gentle touch of his melodic elements in each step and the special arrangements , his Angelripper Tom Sodom come roaring his vocals here with Hel Pyre , a combination of music that became increasingly lifeless . and the slower moments only build up the listener 's anticipation of further mind - ripping segments . The solos are substantive enough to PROVE that they are still a very Necessary element of this type of agressive music , and the melodies are memorable . Another aspect that sets this band apart from some of its competitors is decaying Angelripper Tom 's vocals . more and more favor Headbang Part element in the musical attitude this time Melodiusnya Solo style with a touch reminiscent of old Amorphis and My Dying Bride though still can not beat the composition of the condensed style of his new In Flames and Arch Enemy some styles may still be heard clearly . Each solo actually has a very narrative element to it with slow and fast interchanges , heavy scale exploration and a very Methodical choice of note sequences in each measure of the rhythm . and the last track " Beyond " we can hear speech Solo Guitar Waldemar Sorychta famous with brilliant melodic style gives this track a touch of perfection . It was really melodic and catchy , but still in your face and kicking you into overdrive waiting to hear the next track in wide - eyed anticipation . It's the kind of record that a band releases a mid -career , but as we all know . for you who had idolized the style of Amorphis , In Flames new to Arch Enemy dominant with Catchy headbang Part , would be directly Falling In Love with this band . 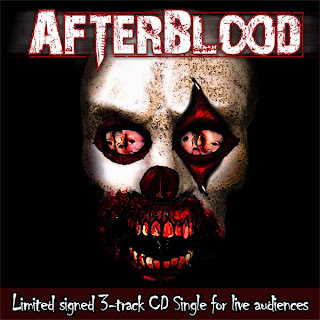 Artwork design comes with the vocalist , Hel Pyre , which teryata bruiser affairs Graphic Design gives a touch of Fair Horrific towards his art . Yes , Extended CD Single for Live Audiences is ultimately an average thrash record , but it has a number of strengths that can not be argued . Absolutely sound is vexed , as if he's still ready to set the world on fire at the drop of an Incendiary . The production is eminent , one of the best or at least most accessible Efforts in their entire career , and the songwriting is also quite diverse , with extended melodic passages that balance out the more direct . YOU MUST TRY IT NOW ! ! !